Happy Saturday! I don’t know about where you live, but here it is a GORGEOUS fall day! 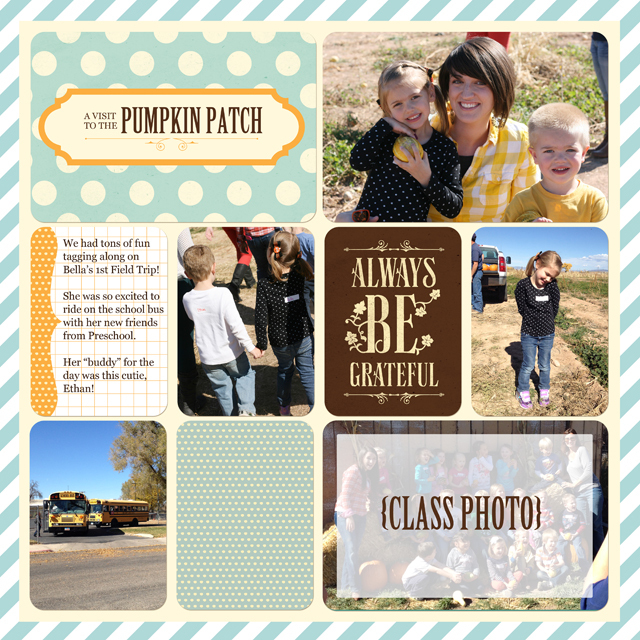 Yesterday was also a beautiful warm day and we got to spend part of it at a local Pumpkin Patch! Bella had her first Preschool field trip and she was so excited about it! Will and I tagged along for fun. Notice anything different about these layouts? Yup, they’re digital! I have been loving all the theme kits that are being released, but I can’e get them locally yet. So I went over to digitalprojectlife.com and looked around. 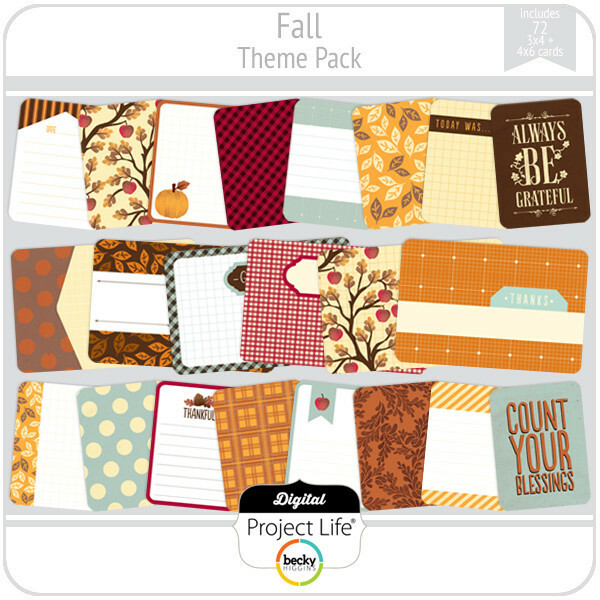 This FALL theme kit caught my eye – and guess what – it’s on sale! It’s a totally different process – but what I do LOVE about digital is that we took these pictures less than 24 hours ago. I love that I can capture the memories (and in this case, silly quotes from my kids) almost immediately. I also scanned in the pictures Bella drew at school that were about the day. 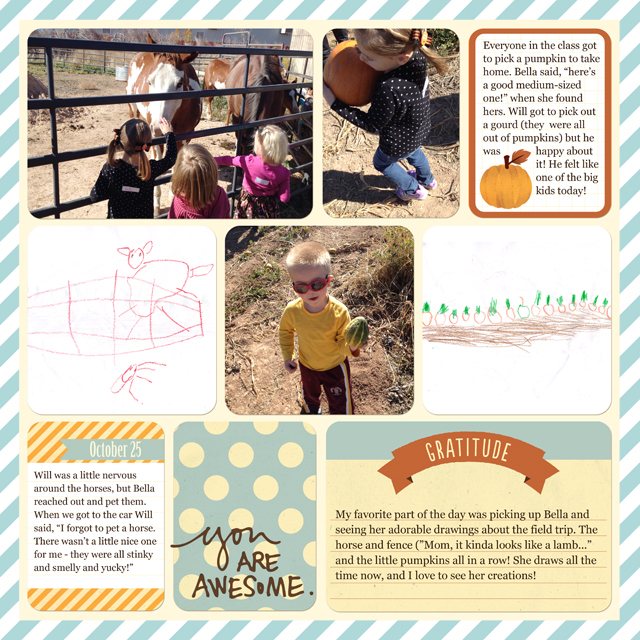 I love the horse and the little pumpkins all in a row! 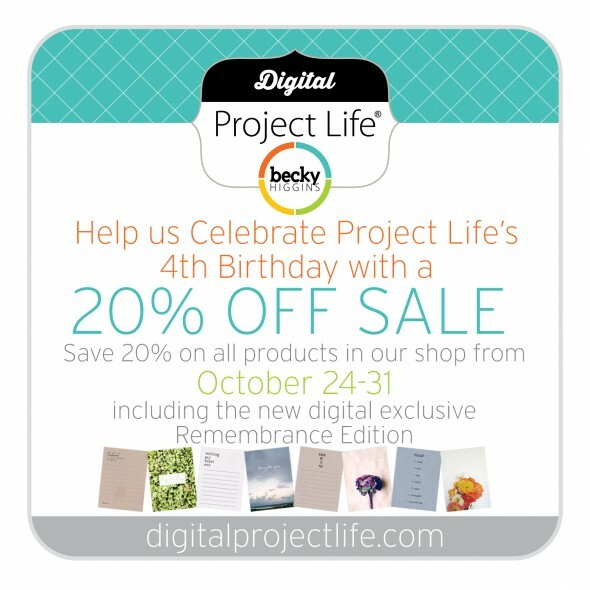 Since it has been birthday month for Project Life, all the products at DigitalProjectLife.com are on SALE right now until Halloween! 20% off everything – including the templates I used to make these layouts, core kits, mini kits, and theme kits. 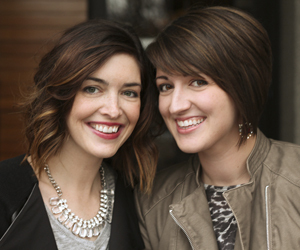 If you’re new to Saturday Share – or Project Life – let me catch you up really quick. 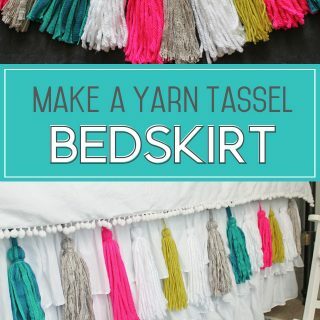 Each week, this fun group of bloggers will be sharing Project Life inspiration as well as a linky party. We want to see what you’re up to and feature you – so PLEASE spread the word to all your PL-lovin’ friends! Be sure to visit the other blogs to see what they’re up to this week – I am always inspired by what I find! 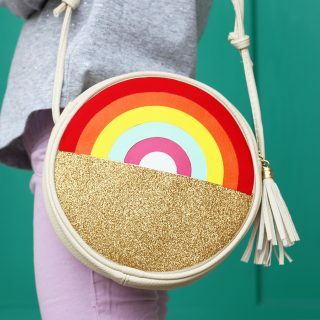 And now, time for the Saturday Share Linky Party! Link up your Project Life layouts, tips, tricks, printables, and anything Project Life related. We are so inspired by you!